Giving children (and reluctant adults) liquid medicine is seldom pleasant. So, drug manufacturers and pharmacists add flavoring and coloring (dye) to make the liquid medicine more palatable. But those same additives make getting the spills and stains out of laundry even more difficult. 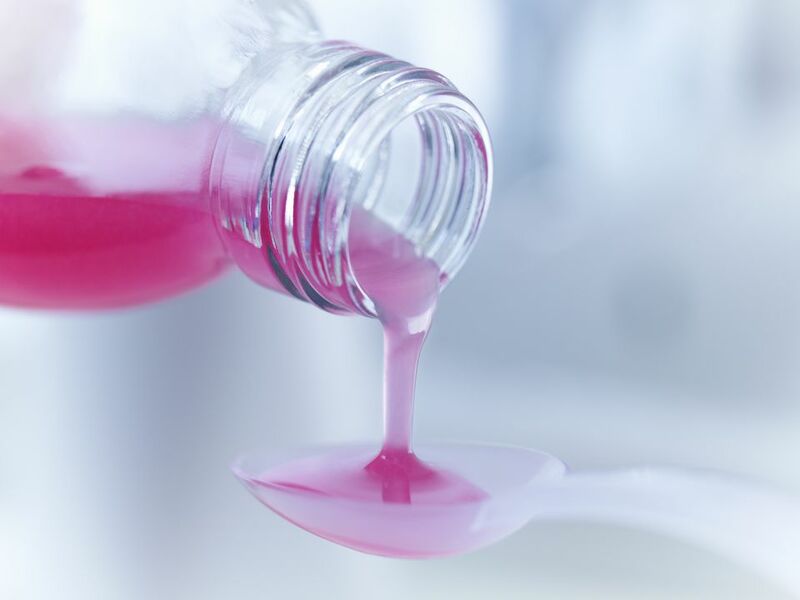 Most liquid medicines are alcohol-based and can be removed with the following methods. As with most stains, liquid medicine stains will be easier to remove if they are treated immediately. But you can use this same technique whether the stain is fresh or several hours old. Hold the stained item with the back of the fabric under a cold water faucet running at full force to flush out as much of the medicine as possible. Mix one tablespoon of distilled white vinegar with 2/3 cup of isopropyl or rubbing alcohol. Using a clean white cloth, sponge the stain with the vinegar/alcohol solution on both the front and back sides of the fabric. Keep turning the white cloth to a clean area to blot away as much of the stain as possible. When no more color is transferring to the white cloth, rinse the stain again with cold water. If the color is gone, wash the clothes or bed lines as recommended on the care label. If color remains, fill a sink or large plastic tub with cool water and add oxygen-based bleach (brand names are: OxiClean, Nellie's All Natural Oxygen Brightener, or OXO Brite) following package directions. Submerge the garment and allow it to soak at least six hours or overnight. If the stain is gone, launder as usual. If slight traces remain, repeat the process with a fresh oxygen bleach/water solution. Always check a stained item after washing and before tossing it into a dryer. The high heat of the dryer can set the stain and make it almost impossible to remove. If the stain remains, repeat the steps before putting the garment in the dryer. If the garment is labeled as dry clean only, blot away as much of the liquid medicine as possible. Blot the area with a cloth dipped in plain, cool water. As soon as possible, head to the dry cleaner and point out and identify the stain to your professional cleaner. If you decide to use a home dry cleaning kit, be sure to treat the stain with the provided stain remover before putting the garment in the dryer bag. The stain remover may or may not remove the stain. Begin by blotting the stain with a plain white paper towel as soon as possible. Work from the outside edges of the stain toward the center to prevent making the stain larger. In a small non-metal bowl or measuring cup, mix a solution of two cups of cool water, one tablespoon distilled white vinegar and one tablespoon liquid dishwashing soap. Dip a clean white cloth, sponge or soft bristled brush solution into the solution and work into the stained area. Blot the stain with a white paper towel moving to a clean area as the dye is transferred from the carpet to the paper towel. You may need to repeat and leave the solution on the stain for 10 or 15 minutes before blotting if the stain is older. If color remains, dip a cloth in rubbing alcohol and apply to the stained area. Blot away with a clean white paper towel and repeat until no more dye is transferred to the paper towel. When the stain is removed, sponge the stained area with plain cool water to rinse away any soapy residue. Leaving soap in the carpet will actually attract more soil. Blot away the water with clean white paper towels and allow the carpet to air dry away from direct heat or sunlight. This last tip is for use on white or very light carpet only. WARNING: This can remove the color from darker fabrics. Dip a cotton swab in a three percent solution of hydrogen peroxide. Blot the stained area and let the hydrogen peroxide sit for two or three minutes. Blot away with a clean dry white paper towel and then sponge with a clean white cloth dipped in fresh plain water. Allow to air dry. The same cleaning techniques recommended for carpet can be used to remove liquid medicine stains from upholstery. Take special care not to overwet the fabric which will leave moisture in cushions. If the upholstery is vintage or silk, call in a professional upholstery cleaner especially if you need more stain removal tips.